Seo Lexie agus Arthur a’ cur na rudan mu dheireadh air an ridire againn! Dh’ionnsaich sinn na diofar ainmean airson pàirtean den armachd. Lexie & Arthur putting the finishing touches to our class knight. We learnt the names of different parts of the armour which was quite tricky in Gaelic! Thòisich clas 1, 2 & 3 air Sumdog an-de. ‘S e goireas matamataig a th’ ann agus ‘s urrainn dhuinn a’ cluich aig an taigh cuideachd! Thuirt a chlas gun robh e uabhasach spòrsail! GM 1-3 got introduced to Sumdog yesterday. This is an online maths resource which can be used in school and home. Everyone said they had lots of fun with their maths! Chaidh GM1-3 a-mach feasgar an-diugh airson spòrs a gabhail a-muigh. Chluich sinn an geama sporsail ‘An Nead aig an Dragon’. 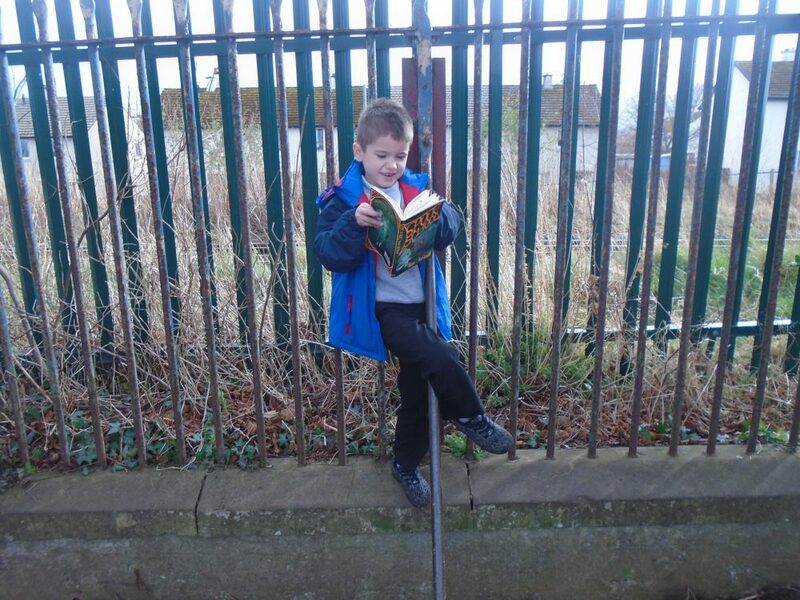 Primary 1 had fun today searching for things outside which could be split in half. They have been learning that to be called a half each part must be equal. It didn’t take long to realise that there are many things in our outside space with are good examples. 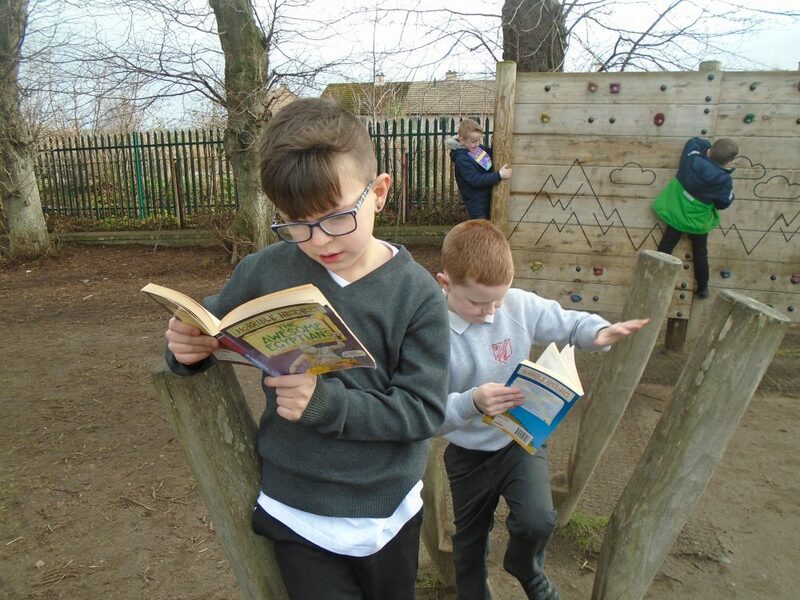 P2/3 celebrated World Book Day by taking part in the school book swap and then taking our books outside for a spot of Extreme Reading. 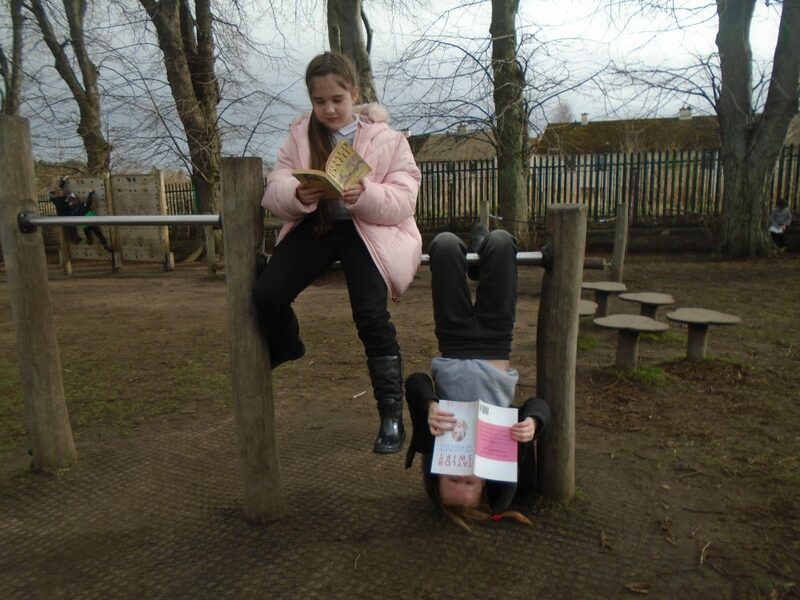 Not only did we read in strange places and positions, but we also had to deal with some very inclement weather! Chòrd Latha nam Foileagan ri GM1-3. Chuidich sinn airson na foileagan againn fhìn a dhèanamh! Bha iad uabhasach blasta! Ium ium..
Primary 1 started off their day by having story time with their P6/7 buddies. 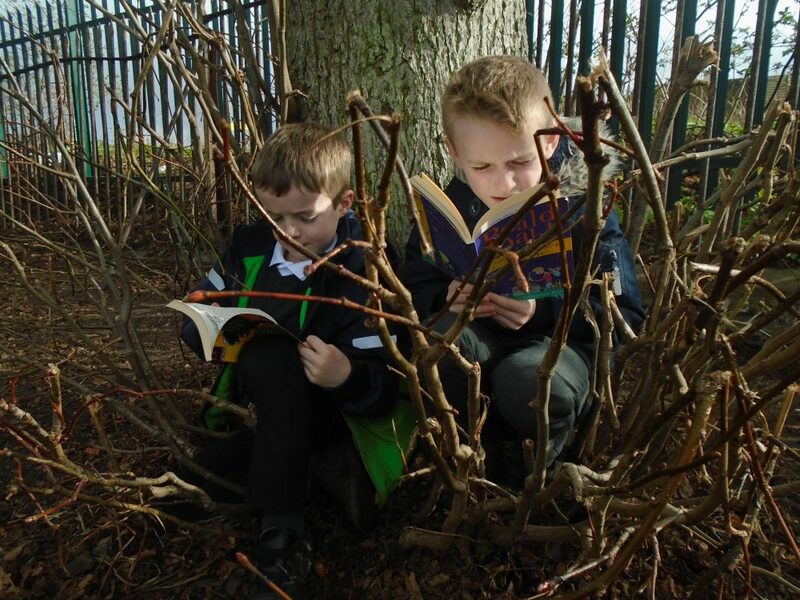 It was a lovely, relaxing start to the day because the older children are very kind buddies and the Primary 1 children all love to hear stories. 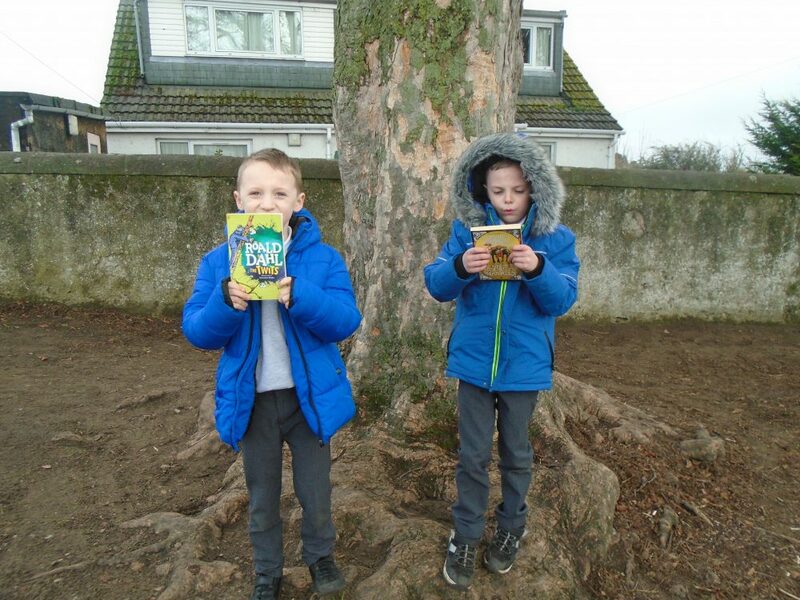 Later, Primary 1 listened to the story of “The Pirates Next Door” and went on a treasure hunt in the class. That was lots of fun! 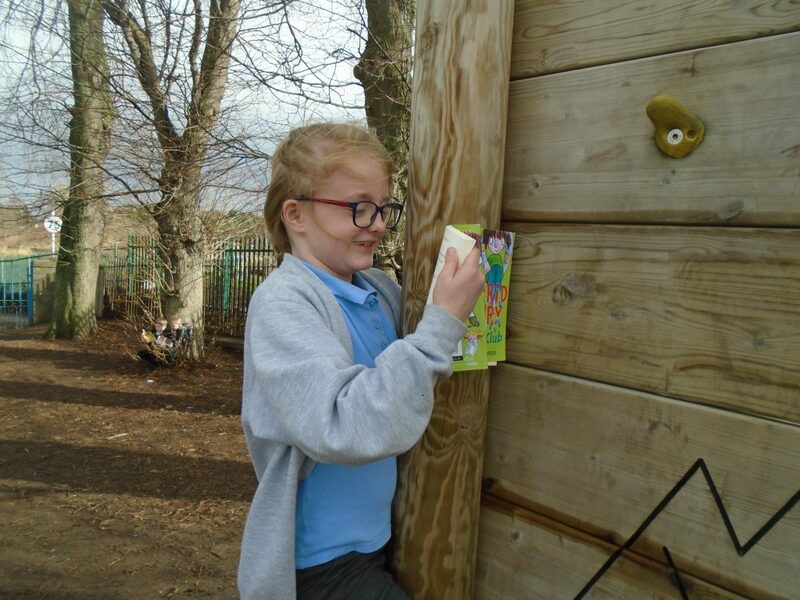 Everyone found an envelope containing a forfeit and received a little prize for completing their forfeit. 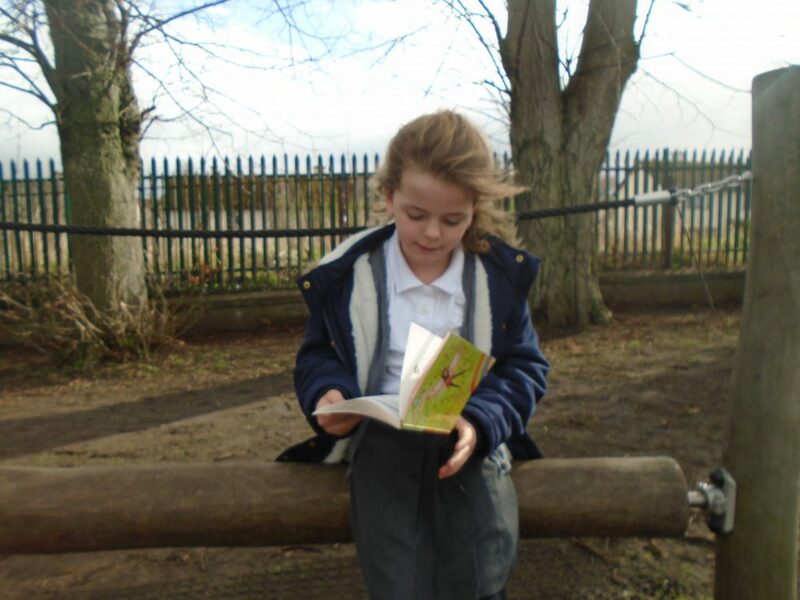 All the children were then delighted to be given the chance to choose a book at the Book Swap. 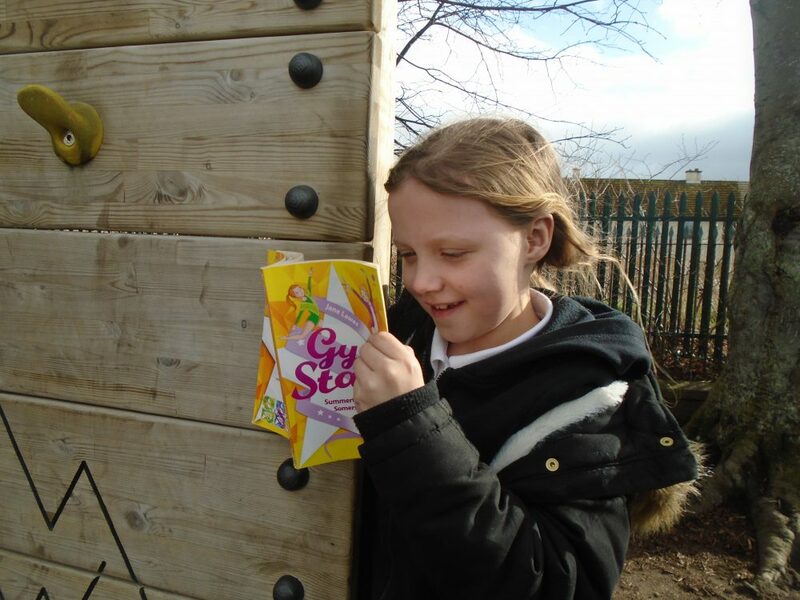 Books really are fun! Happy reading everyone! P6 were very grateful to the guys from Nairn Dunbar Golf Club who came to teach them about golf! They loved having a go at chipping and putting the ball. 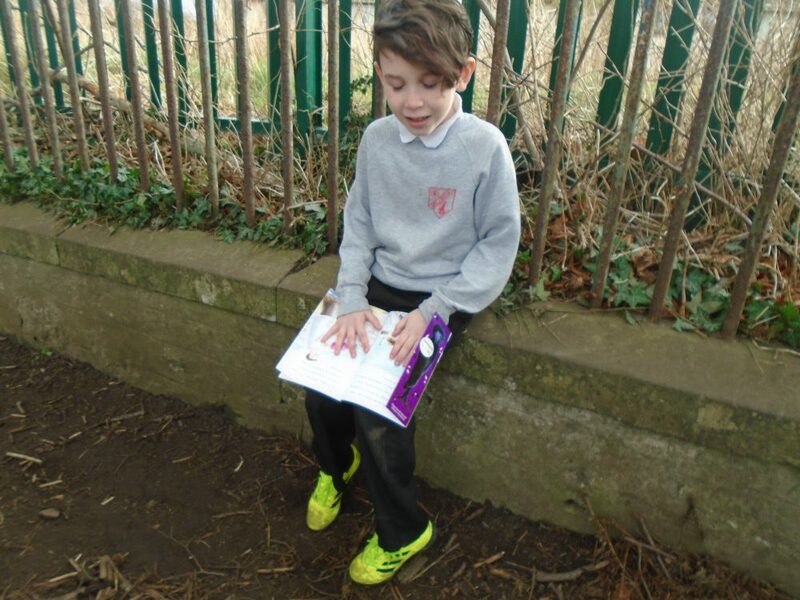 I was very impressed at how well the children were doing and saw some fantastic effort from them all! Have a look at P6 in action. On Monday P3/4 had great fun building owl robots with the SPCA! We are very proud of our Technology Team, On Tuesday they ran workshops on using Google Docs, Drive, Classroom and TT Rockstars to parents/carers at the Chromebook Information Evening. They showed off their fantastic knowledge about the Chromebooks and were very polite and helpful to all that attended. The team has been praised by numerous parents/carers and staff members. They were all stars of the week. Well done!